Awesome cake! And it's Veronica's first one! 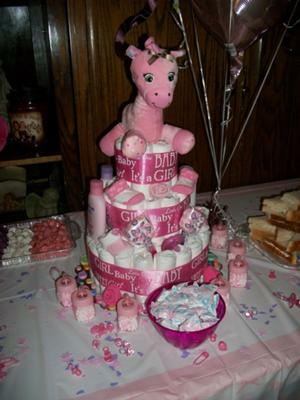 Her diaper cake adornments (ribbon, confetti, and decorations) are tastefully done and the adorable pink giraffe is perfect for a baby girl! Her cake is definitely the focal point of the baby shower table. Veronica is one of our wonderful readers and has paid it forward with her darling diaper cake ideas. We love our readers! Veronica, thanks for your lovely cake! We hope all our readers enjoy it! 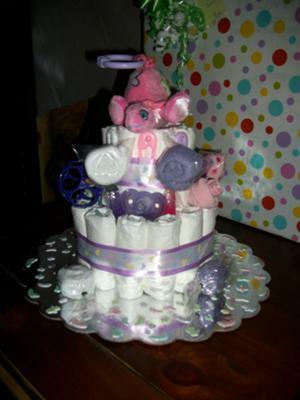 Submit your diaper cake pictures and ideas right here! For my first try at making a diaper cake I started with a silver cake board, made the bottom layer, and hot glued pastel buttons around the bottom. The end result turned out better than I could have imagined and the mom to be Loved it. So did eveyone else who attended the shower. I used baby sock roses and washcloth lollipops to help decorate it. I also made a smaller 2 tier cake that I used footprint stickers on the cake plate and did in more of a purple theme where the big one was mainly pink. definitely the focal point of the baby shower table! very cute cake! thanks for sharing and keep sharing these kind of pics. This is awesome and i appreciate it. Incredible! Just what an eye fixed opener this is to a baby shower. Quite definitely treasured, book marked, I can’t wait for a lot more! this is very good post about first time diaper cake baby girl.I like to read articles like this from where i can increase my knowledge.So thank you for this. I started with a silver cake board, made the bottom layer, and hot glued pastel buttons around the bottom. The end result turned out better than I could have imagined and the mom to be Loved it. Diaper Cake is new type of cake for me and this one has very unique style of cake which is actually very attractive. But we can say that this is amazing selection of cakes. well! excellent collection of baby stuff contain this site. However, I need assignment help service but as a mother love this site and all stuff as well. The end result turned out better than I could have imagined and the mom to be Loved it. So did eveyone else who attended the shower. but i never visited your blog. I added it to favorites and i’ll be your constant reader. It is because the data you used in it is very useful for me. I would like to thank you for sharing this. The people who are educated can help the society in numerous ways. They have the power and thus can help the people by making such policies for the society who are prove to be beneficial for the people in terms of education. One of our relatives did the same kind of cake for their baby's first birthday. I think they might have got the idea from you. Wow Veronica that is an impressive piece of cake work. I loved it a lot. The idea of decorating it with the baby sock roses and washcloth lollipops was very innovative.